People and organizations have employed the fish trap in Alaska since before the beginning of the fishing industrial complex in the late 19th century. However, new technologies that allowed for the canning of fish at a higher rate brought capital into southern Alaska like no previous time in history. Industrial fish traps coming into use threatened the traditional ways of living for Native communities throughout Alaska. I have read many letters from village leaders, dating from the nineteenth to well into the 20th century addressing territorial and federal government officials with appeals to cease the practice for the sake of village survival. By 1889 the territorial government made illegal blocking off entire rivers with traps. 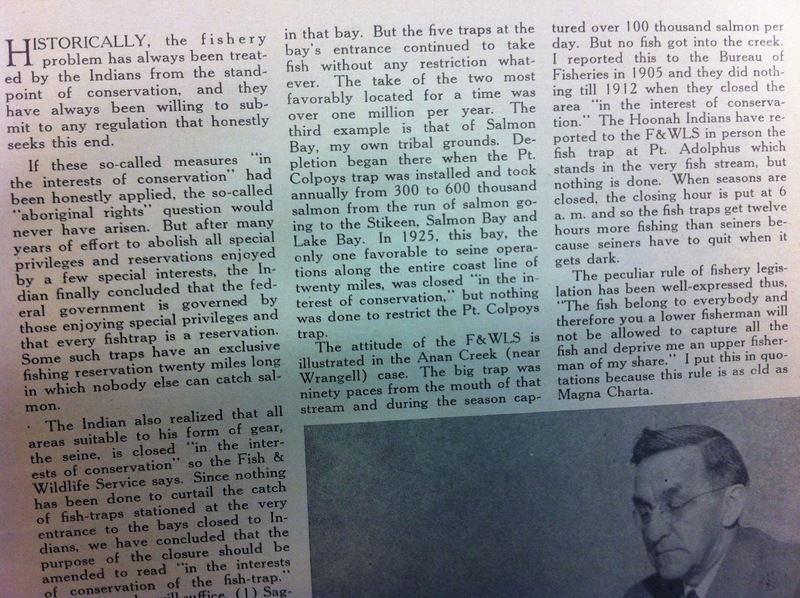 In 1906 any permanently secured traps within known salmon migration routes were forbidden. Scholar Steve Colt has the great resource "Salmon Fish Traps in Alaska:An Economic History Perspective" on the Alaskool website here. He contends that the rise of fish traps brought two problems to Native Alaska. "Besides appropriating [Native people's] major food source," he writes, "the fish trap replaced purchases from Native fishermen and made Natives the first group to join a growing chorus of protest against the brutal efficiency of the trap." In other words, the trap left Native fishers without jobs and the larger Native community with less food. 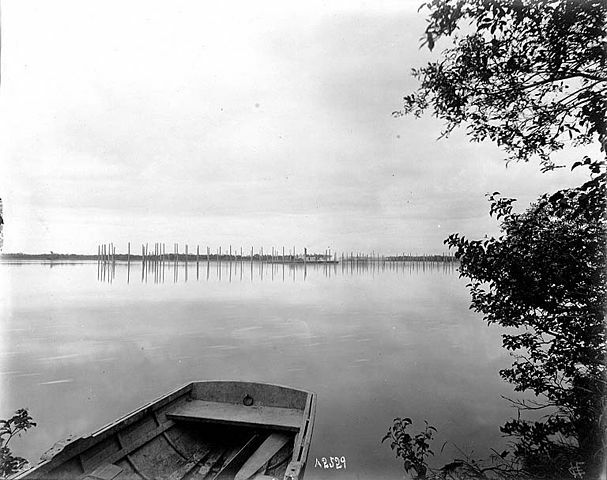 Alaska Packers Association fish traps on Wood River, Bristol Bay, Alaska, 1900 Photographer John Nathan Cobb. 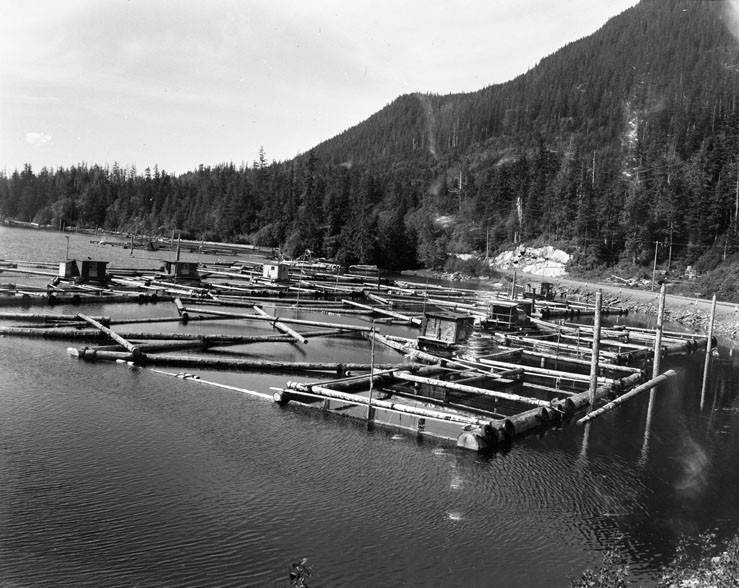 When an organization would set traps at the mouths of rivers these traps would capture great amounts of salmon, leaving little to none for village subsistence users. What was seen as blocking off entire traditional fishing areas to Native communities proved a deeply political issue for decades within Native and non-Native households. 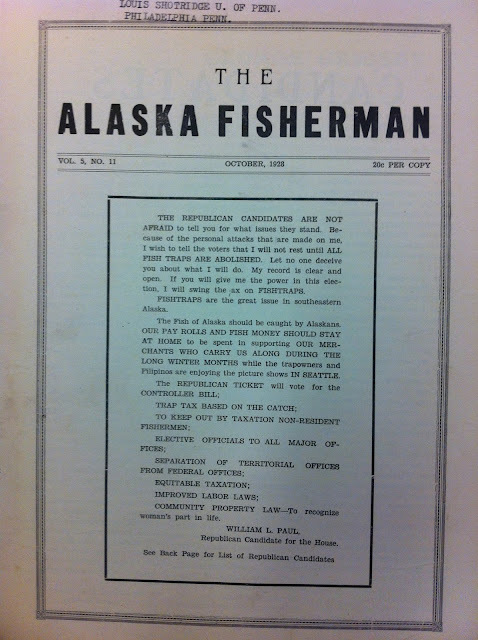 William Paul in the October, 1928 publication of the ANB newspaper The Alaska Fisherman made the desisting of fish traps one of the main agendas during a campaign for office. He writes that what sets him apart from other candidates was that, "I will not rest until ALL FISH TRAPS ARE ABOLISHED." "Fish" he asserts, "should be caught by Alaskans." In the statement he also aligns the seasonal colonial fishing enterprise with the racialized migrant labor force these companies hired in situations extremely asymmetric for Filipinos. In a previous post I've examined how William Paul felt camaraderie with Filipinos workers in Alaska, yet this political advert below is not without the intonation of racialized language. Previous to the 1930s Filipino cannery workers, not yet unionized, faced harsh and forbidding conditions amid long hours of work often in secluded cannery sites. Paul's affront to "trapowners" and "Filipinos"I think should be weighed with the consideration that many in these two groups would leave Alaska after the closing of fishing season to places where food sources where in great supply. Perhaps with this statement he could rouse non-Native non-Filipino workers into voting for him by figuring an imagined sincere bond between the "trapowners" and Filipino workers. As a student of power, I find the forging of affiliations and dis-alliances between racial and indigenous communities in formal political arenas as unending and not surprising in anyway. Additionally, if ones peers to the bottom of the advert one can see Paul's appeal to women voters with his support of a platform that would "recognize woman's part in life," by redefining "Community Property Laws." Taken together, the racialization of the fish trap issue, and all for the mobilization of women voters, shows the importance fish traps and property rights were in Alaska Territory amid the first decades of the 20th century. 20 years later William Paul still found the topic of fish traps deserving of his time. 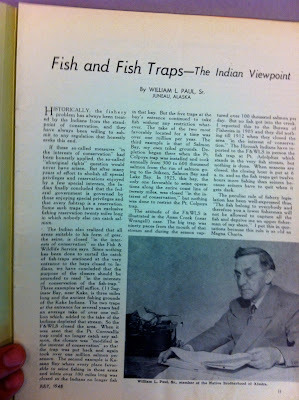 Here is a 1948 article (from I believe Eskimo Magazine) where Paul, freed from the impressing discourses of formal governmental politics, lent a more substantial read to the problems fish traps cause for Native communities. 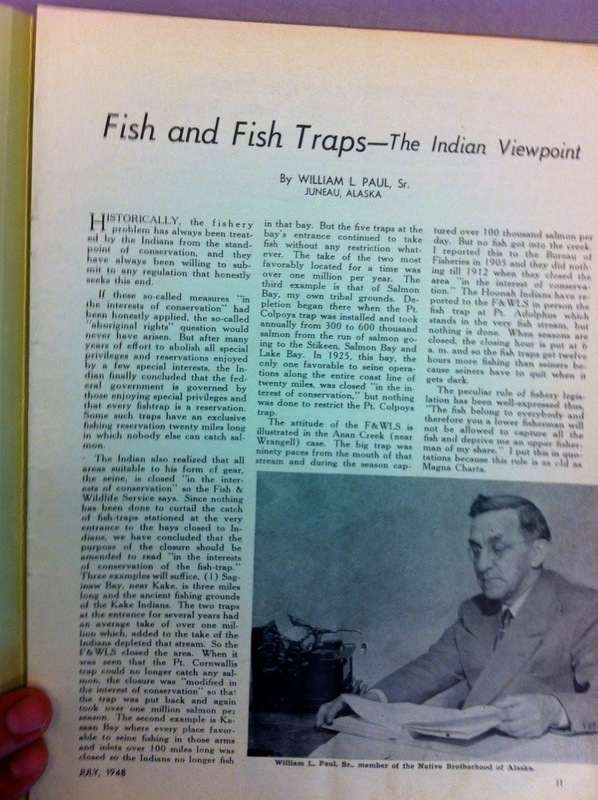 Entitled "Fish and Fish Traps—The Indian Viewpoint," the article pits industrial fish traps as contrary to Indigenous ways of living. Yet as Paul drew out this argument he also put forth that Native people have always being willing to "submit" to any regulation that "honestly" seeks "conservation" as "its end." Noting forms of conservation efforts as colonial practice, he writes that, "The Indian realized that all areas suitable for his form of gear the seine is closed 'in the interests of conservation.' " Perhaps one could infer the meaning of this passage as Paul communicating that industrial capital with fish traps could convince governments to open expanses of water to suit their needs while Native communities without such power would find their traditional areas closed to their use. In the end of this article Paul wrote that those fishing up river should be allowed to capture as many fish as the fish traps built along its mouth. "The fish belong to everybody," he writes, "and therefore you a lower fisherman [at the mouth] will not be allowed to capture all the fish and deprive me an upper fisherman of my share." This saying was to him a principle as "old as the Magna Carta," signed in 1215 by English king John proclaiming that no one is above the law. These pieces by William Paul are only two of the many pieces written by Alaska Natives concerning the Native environmental politics of fish traps in 20th in Alaska.